Product prices and availability are accurate as of 2019-04-16 21:24:48 UTC and are subject to change. Any price and availability information displayed on http://www.amazon.com/ at the time of purchase will apply to the purchase of this product. 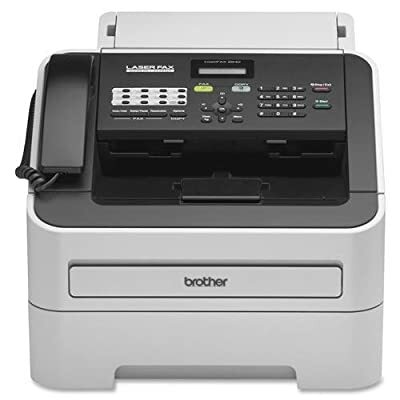 Maximum Copy Size (W x H):8 1/2" x 14"
Brother FAX2840 intelliFAX-2840 Laser Fax Machine, Copy/Fax/Print IntelliFAX-2840 laser fax is ideal for home offices or small offices. It features a 33.6 kbps modem, 16MB memory and a 20-page capacity auto document feeder for faxing and copying multiple pages. This compact fax offers 272 broadcasting locations, 200 speed dial locations, 22 one-touch keys and can even receive fax and voice calls on the same telephone line. It has a generous paper tray capacity of 250 sheets and a USB interface for future printing capability.